The north side, with the gatehouse to the left. At first sight the castle at Fethard-on-Sea looks really impressive. But as I approached I could see the green fence completely surrounding the castle was going to deny access. The north side of the building, pictured left, is in such a poor state of repair the fence is quite understandable. After the Norman invasion in 1169 these lands were granted to Hervey de Montmorency by his brother-in-law Strongbow. Hervey gave the land and churches to Christchurch Canterbury. 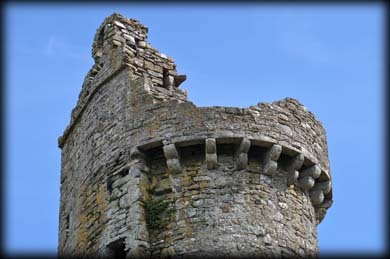 In about 1200 they granted the town of Fethard to Richard de Londres on the condition he would be build a castle there. In 1634 Bishop Thomas Ram granted the lands to Sir Nicholas Loftus, the son of Sir Dudley Loftus of Kilcloggan. 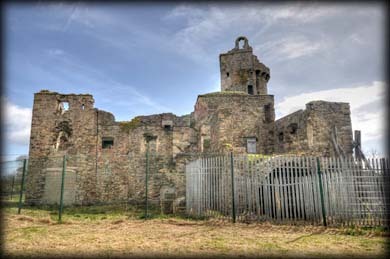 The castle was occupied up until the early 20th century. During this time it underwent several modifications including alterations to the windows and south west tower. Situated: In the centre of Fethard-on-Sea. On the east side of the R734. From Wellington Bridge take the R733 west. Then turn left onto the R734 for the Hook Peninsula. Discovery Map 76: S 7930 0524. Last visit April 2015.